How to remove virus from computer? After taking the necessary steps of protecting your computer from virus, it still gets infected by a virus. Mostly, if you use internet very often the chances of having a virus in your computer will increase. If your computer gets caught by virus, automatically you should remove it using the best anti-virus program. Actually, no anti-virus program guards 100% your system from possible virus attack. But you will reduce the risk by 95% and even more depending on the quality of anti-virus program. However, what will you do about a virus that is recognized by anti-virus program but won’t be removed or deleted? I often encountered with such kind of virus. But I easily managed to remove virus from computer using the technique mentioned in this article. It is the best way to get rid of computer virus - almost completely. Don’t have an anti-virus program installed on your computer, you should install now. If you already have one, make sure it is updated with the latest definitions. Regarding anti-virus programs, several types of anti-virus programs are available on the market. You may spend a little to get the best anti-virus that can access any type of virus; if you can’t afford to buy you can get free versions. Anti-virus programs such as Avast, Avira, AVG have free versions which can be downloaded directly from their site. These versions luck some of the features found in the commercial anti-virus products. In Windows XP computer, to turn off System Restore, Click on Start--->Control Panel and Open System. System Properties dialogue box will open. 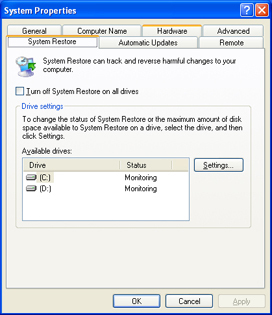 Click on System Restore tab and CHECK the box beside “Turn off System Restore on all drives” label or can only turn off the drive of your choice. But it must be your root drive. Restarting your computer in SAFE MODE is the next step to remove virus from computer. 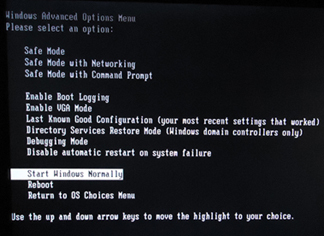 In Safe Mode, a computer system loads with basic files and drivers that are important for running your computer. This will help to keep some programs and services disabled. And these are the places that easily get infected by a virus. In Safe Mode the virus will remain dormant since most of the nonessential programs are inactive. To start your computer in SAFE MODE, reboot your computer and while rebooting keep PRESSING F8 Key before the Windows Logo come. Windows advanced options menu will appear, like you see below. Using Arrow Key, choose SAFE MODE from the menu and Press Enter. Windows will log in after listing a series line of text. You will see SAFE MODE at the four corners of the screen which tells that your computer is now in SAFE MODE. Finally, you should fully scan your computer with the anti-virus program. In addition, in order to remove any kind of malicious code effectively you may use additional Spyware, Malwares, Adware, Trojans removal tools. 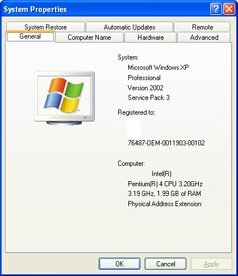 After cleaning your computer from viruses, restart your computer and TURN ON SYSTEM RESTORE. Now, you have a virus free computer. These are the steps all you need to remove virus from computer completely. However, as new viruses are emerges every day, you should always insure that the anti-virus program installed is updated with latest definitions. In addition, always be vigilant about new threats. The anti-virus programmers will develop a cure for the new virus, till then it may get into your system and damage your data.